BOSTON — The Huntington Theatre Company can look backward just as easily as looking forward. The theater nourishes new works and emerging local playwrights, but also looks backs regularly to revisit the classics, especially those with timeless themes. The latest example is a stirring, powerful production of Clifford Odets’ “Awake and Sing!” at the BU Theatre. There is nary a weak link in the ensemble in the story of three generations of an immigrant Jewish family living under the same roof of a cramped Bronx apartment in 1935, trying to better their lives against the struggles of the Great Depression. Odets was writing at a time when the very foundations of our economic system were being called into question when he delivered us the story of the Bergers, a working-class Jewish family, whose dreams of a brighter future seemed doomed by conditions beyond their control. Bessie Berger (Lori Wilner) is the matriarch of the clan, in a constant, frantic search for the means to keep the family together and afloat. Her determination leads her to do almost anything in her power that will allow the family to stay in its home and off the street. That may mean marrying off 26-year-old daughter Hennie (Annie Purcell) — who is in a certain condition — to a hapless immigrant whom she doesn’t love named Sam (Nael Nacer). It may mean taking in a boarder such as Moe Axelrod, with a nuanced performance by Eric T. Miller as a maimed, cynical, embittered World War I veteran who has a “yen” for Hennie, and he doesn’t mean a Chinese coin. It may even mean deflecting a financial windfall headed the way of her 22-year-old son Ralph (Michael Goldsmith). He is relegated to a day bed in the living room, itching to get some privacy and money — or both. Trapped in a dead-end, low-paid clerk’s job he yearns for the means to start a life with his girlfriend and, someday, find the fast-disappearing American Dream: a home and family of his own. Bessie’s husband Myron (David Wohl) is a meek, good-hearted soul out to do the best he can and get along with everyone. Uncle Morty (Stephen Schnetzer), who has clawed his way up the economic ladder to become a well-off businessman, is often the target of his father’s ire, and becomes the center of the debate about the plight of the working man even as he battles a strike in his own plant. Reading the program notes, directing this production was a labor of love for Melisa Bensussen, and the actors responded to her enthusiasm and passion for the piece. 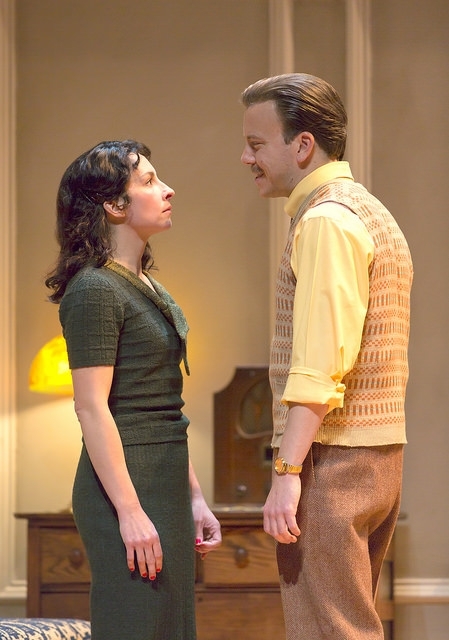 Odets asks us to consider: Is money , moreover the lack of it, a sign of someone who is worth less in our society? Should a worker be a slave to it, and are those who don’t have it are something less in the eyes of God? There will be a death and, in its wake, the rebirth of Ralph. 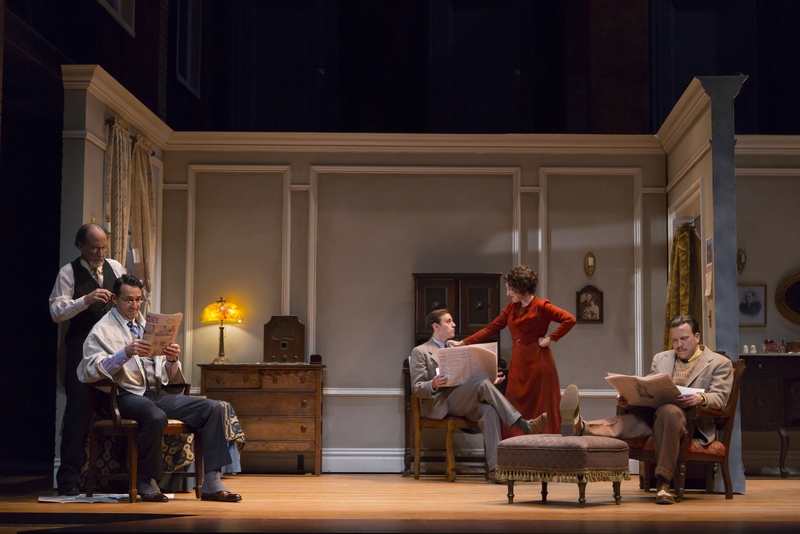 Odets will allow Ralph to profess the playwright‘s hope for the future: “Maybe we can fix it so life won’t be printed on dollar bills,” as he takes Jacob’s exultation to “Awake and Sing!” to heart. There will be new hope for other members of the family. The spot-on costumes by Michael Krass and James Noone’s superb set lends yet another layer of authenticity to the piece. The fastidious Berger apartment rolls in from both sides of the stage, and is backed by an exquisitely-detailed Bronx tenement. It will forever be a credit to Odets — who was all of 25 when he wrote “Awake and Sing!” — that, with all the despair that was swirling around him, he was still able to see the light at the end of the tunnel.